Hatters boss Nathan Jones is relishing the ‘crazy’ nature of League Two as his side look to continue their push for the play-offs against Crawley Town this afternoon. 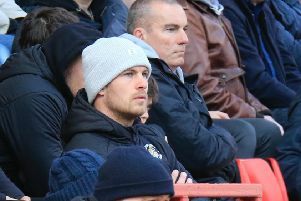 Few gave Luton a chance of figuring in the top seven when Jones took over, as they had been cut well adrift, but four wins from four has reinvigorated hopes of extending their season beyond May 7. Now just three points behind AFC Wimbledon, Jones said: “It’s a tight league, but that’s the beauty of the play-offs. “In League Two more teams than any other go up, the top seven are all in contention constantly and it’s brilliant, it keeps the season open for lots of teams. “It’s a crazy league in terms of anyone beats anyone, but the Championship is a bit like that as well. So I’ve been used to that in terms of sides at both ends of the table, they can win games out of nothing. “People gather form at different times and confidence, there’s so many crazy results. “It’s a difficult league, but what we have to do as we keep saying is adding that consistency. All our players, the game changers that have to come on, they’re part and parcel of what we’re doing. Jones has now been in charge of the club for 10 games, picking up 20 points in that time. If Luton were to replicate that form for the final 11 matches of the campaign, it could well be enough for a top seven slot, with 70 points the average benchmark during the past five seasons. On his run so far, Jones continued: “We’ve had a consistency in performance, and we’re building and asking them to do different stuff constantly. “We’ve had a few little blips but in terms of a 10 game period, it’s been a decent period. I’d been lying if I said we weren’t happy where we’d come in the last 10 games, but we have to have that consistency over 46 games and that’s what we want. “We know we’re going to have the odd performance that you have to put to bed and learn from, but that’s part and parcel of careers, part and parcel of learning curves, part and parcel of building a better club, team, individuals. On what has pleased him most about Town’s winning run too, Jones added: “Just the reaction we’ve had as I asked for that after we lost a game (against AFC Wimbledon). “The desire has been superb, we’ve scored late goals to win games, been patient, showed different elements of our character. “We’ve won games and that’s been really pleasing. They have a hunger about them now, the group is a real hard working group. “We’ve asked for little steps and progression and I think we’re getting there as well.